Colga winners: David Morrissey, Connacht u-16 manager, with Leah Philips, Keara Cormican, Jenny Kinnane and coach Caitriona Murphy. Colga girls continued their run in the u-16 Irish Cup with a successful trip to Belmullet where they overcame Killmore FC by 6 - 4 on Sunday. The Galway club will now meet Donegal side Illies Celtic FC in the last eight. Drawn away again, this will be Colga’s third successive match on the road. However last Sunday it did not deter the Colga girls from grabbing the honours, despite being behind at half time by 4 - 1. That was largely due to Killmore winning the toss and opting to play with the strong wind. 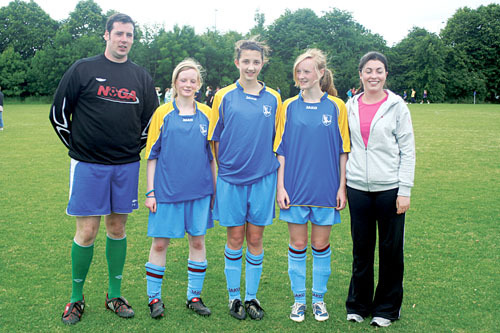 The game was only two minutes old when Anita Doherty put Killmore ahead, and they made it 2- 0 by the sixth minute when Tamara O’Connor scored. Before the break both Doherty and O’Connor had added to the scoresheet to make it 4 - 0. However Colga, who were defending resolutely and counter-attacking when they could,were rewarded on the stroke of half time when Rachel Bannon scored. Changing tactics to suit the conditions in the second half, they were quick to capitalise with Rachel Bannon scoring another two, claiming her hat-trick. Lisa Casserly scored twice, from a free kick and directly from a corner before Sinead Heavy made it 6 - 4 in Colga’s favour. Colga: Mary Heavey, Jenny Linnane, Linda Corcoran, Jenny Kinnane, Leah Philips, Keara Cormican, Lisa Casserly, Sinead Heavey, Rachel Bannon, Alana Moran.